directorial and screenwriting debut arrives in Toronto for a commercial release right after great hype at both the Venice and Toronto International Film Festivals. Having high expectations, I was ultimately disappointed. The film is good but not that good, falling into the trap of the typical failed romantic drama due to personal demons and artistic conflict – predictable storyline of personal conflict and over-staged drama. The film opens with super singer Jackson Maine (Cooper) performing live at a huge concert. It is an amazingly shot scene complete with a screaming crowd, astounding acoustics and musical performance, setting the stage for more outstanding performances to come. And they thankfully are, whether performed by Jackson or his rising star, Ally (Lady Gaga). But Jackson is clearly on a self destructive course. He arrives at a bar after the opening concert, dropped off by his chauffeur. He ends up in a drag bar (because Lady gag has the hit gay positive song, “Born This Way”) where he is impressed by Ally’s performance of La Vie En Rose. Apparently she is so good, she is the only non drag performer allowed to sing there. Jackson takes her home and this is the beginning of the relationship in which Jackson also grooms Ally to be a star. The rest is history and the story almost everyone in the movies is aware off. As Ally rises to fame, Jackson downward spirals into losing his. Jackson also suffers from a hearing problem and has a rift with his older brother and manager (Sam Elliot, who is good but mumbles half his dialogue). Cooper’s film captures the atmosphere of the rich and famous, from the parties, the glare of the spotlight, the attraction of fame as well as the pain that comes with it. The main trouble is that it can safely be said that the audience has seen all this before -a star’s rise to fame, her lose of identity (clearly mentioned a few times to make its point) and conflict of interest. Cooper’s film attempts to bridge the gap between having a solid relationship and a successful singing career This does not happen. One basically has to give up family life for musical fame. This story is more effectively told in the gut wrenching documentary BAD REPUTATION, about the life and career of girl rock and roller Joan Jett, that coincidentally also opens this week. BAD REPUTATION puts A STAR IS BORN to shame. BAD REPUTATION is the real thing where Jett maintains her identity, ditches family life to launch a successful music career that audiences can root for an identify with. 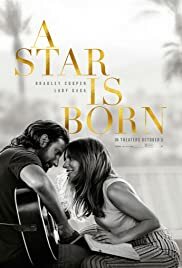 A STAR IS BORN, unfortunately sinks into predictable melodrama at many points. The film also suffers from having two protagonists Jackson and Ally instead of just concentrating on Ally. Cooper is ok, he has his star charm but it is Lady gaga that makes the movie. She does not look anything like the Lady Gaga everyone is used to seeing and it is her that the audience sees that a real young and rising star is born. Move over Madonna! 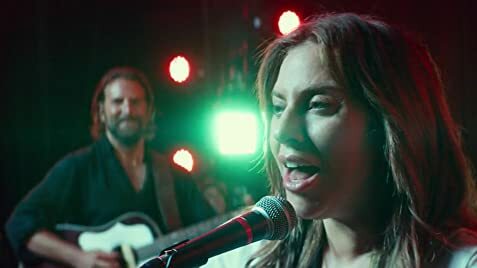 Still A STAR IS BORN will be well received by many as a love story that hovers between the shadow of tragedy and the bright light of artists at their peak as observed by many of the teary eyed audience (mainly females) who left the theatre at the promo screening.